Why Would You Talk in Sleep? What to Do? Talking during sleep is quite common and may be nothing to worry about. However, it may signal a sleep disorder that needs to be checked out. It is common in both children and adults and may range from senseless babbles to full on conversations. 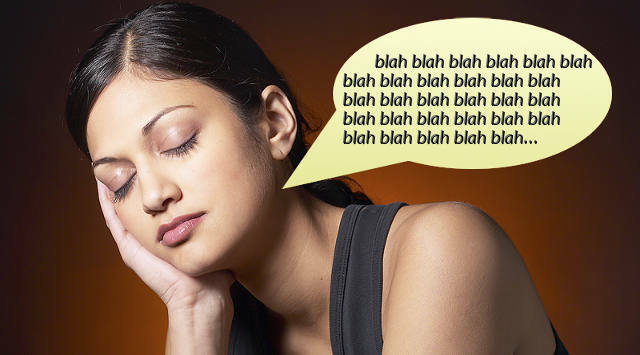 Some sleep talkers may even answer questions appropriately or even seem awake. This article discusses why this happens and things you can do about it. Doctors often don’t find a clear cause of why you talk in your sleep. Many times a sleep study needs to be done to watch your body during any sleeping behaviors. A medical reason may need treatment, but most aren’t anything to worry about. It is helpful to know some of the reasons why sleep talking happens so you can take the steps to quiet your body and mind so you and your loved ones can get a good night's rest. This is an actual sleep disorder that causes you to talk in your sleep. There is no actual cause and it is completely harmless, with the exception of keeping your partner awake. It is common in about 5 percent of the population and usually doesn’t require treatment. If you are under too much stress during waking hours, this may come out as sleep talking. Not relaxing before you go to bed may cause you to relieve stress during your dreaming states by talking about whatever is stressing you. Stress in a relationship may also cause you to reveal how you really feel about your partner and you may answer their questions when asked. Depression can cause an increase in talking in your sleep. There may be things you are not addressing when you are awake and your subconscious is venting them while you are sleeping. It can also occur due to the insomnia that co-exists with depression and a sign of sleep deprivation. This kind of sleep talking may benefit from treatment of the underlying depressive episode. People who suffer from depression have also been known to cry in their sleep. Nocturnal (nighttime) anxiety may cause you to babble during your sleep. In theory, this may be due to excess adrenal hormones being released during sleep and keeping the body partly awake. While these conversations may not be recalled in the morning, anxiety could make you talk in your sleep all night long. If you yell out and scream in your sleep you may be suffering from night terrors. You may not actually feel fear while you are sleeping, your body acts or yells out in fear or aggression. This condition may need treatment as it may go along with sleepwalking or flailing the arms and/or legs during sleep causing injury to a partner. Talking in your sleep may mean you have a coexisting sleep disorder like sleep apnea. This would mean that sleep talking is a symptom and would need to be checked with an overnight sleep study. Sleep apnea occurs when you temporarily stop breathing in your sleep. Moderate to severe cases of oxygen deprivation that occurs with sleep apnea may need treatment while you sleep. High fevers can cause delirium, which can manifest itself as talking while asleep. This is caused by changes in the brain in response to the fever. Someone with a high fever may not even be asleep, but acting lethargic and talking nonsense. This usually goes away with the fever and doesn’t cause any lasting damage. The use of stimulants (caffeine, medications, and street drugs) may not allow your brain to shut down at night. You may fall asleep, but continue to talk in your sleep. This may also accompany walking or eating in your sleep. Talking while you are asleep may affect you, your partner, or family members. There are a few things you can do to help reduce the amount of sleep talking and help everyone get a better night's sleep. Get to bed at the same time every night. Your body may be overtired. You need a good sleep schedule to help yourself get the rest you need. Going to bed late and overtired increases the likelihood of sleep behaviors. No caffeine or alcohol after 3 p.m. Avoid caffeine and stimulants after 3 p.m. If you take a prescription medication that has a stimulant effect, ask your doctor about taking it in the morning. Even though you may think they relax you, avoid alcoholic beverages before bed. Try “White Noise.” You can try using a fan or low music in your room to drown out any mild chatter during sleep. This will help your partner sleep better. It may even help you sleep better. Keep your stress in check. Practice relaxation techniques to help relieve daily stress. Do things to help you unwind after work and before you get to bed. Try journaling, meditation, yoga, or even deep breathing exercises. Have a light snack. Don’t eat too heavy, but a light snack may help you sleep better. Try to eat something like crackers and cheese or a half a sandwich. Many sleep talkers also experience “sleep eating” in the middle of the night. This may be due to blood sugar drops while sleeping. What Are the Psychological Effects of Stress?